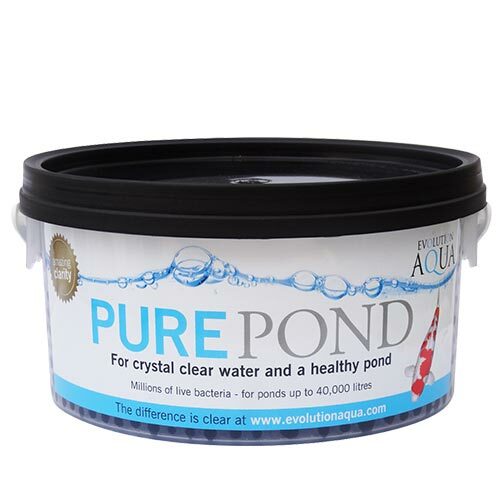 Pure Pond is our Award Winning bacterial product that helps to maintain crystal clear and healthy pond water. PURE POND are biodegradable balls, crammed full of live bacteria and enzymes that when added to your pond filter get to work breaking down Ammonia and Nitrite, whilst cleaning up organic waste. The bacteria and enzymes are slowly released when they are needed most to address biological issues in the pond that are often the cause of poor clarity. When using PURE POND balls as a maintenance product, especially when added once a month into your filter, the balls will help to maintain crystal clear and healthy water.